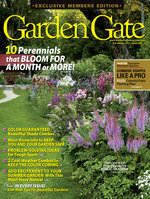 If you have a lot of plants that need protection from the cold, using fancy cloches can get expensive. 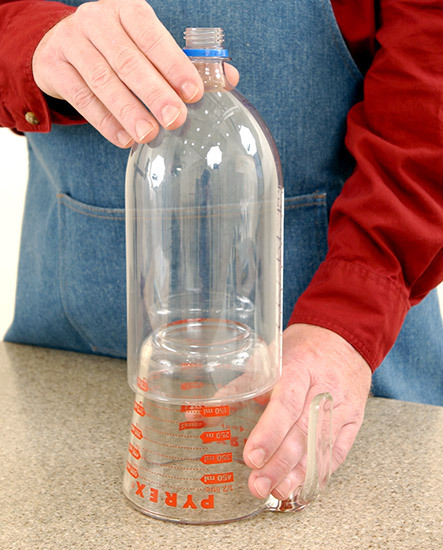 So adapting 2-liter plastic soda bottles is a great way to get the benefits of a cloche without the high price. Gather up several 2-liter soda bottles. Remove the bottoms just above the “feet.” Cut through the plastic on a cutting board, using a sharp utility knife. 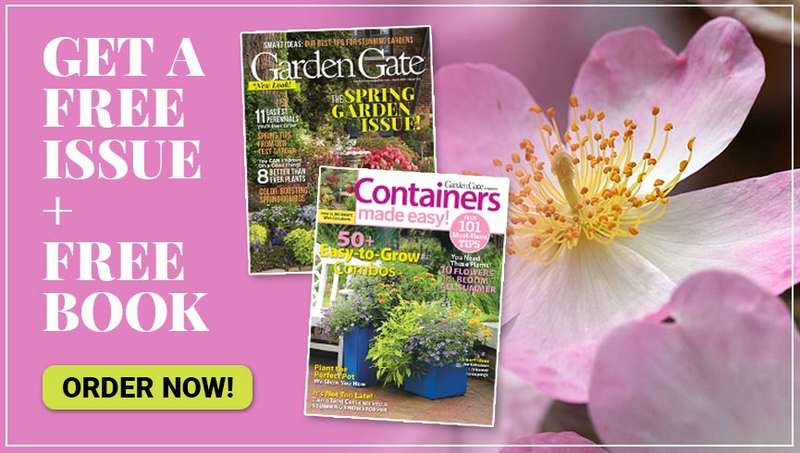 Trim off any “spurs” or jagged edges. The smoother and more even the cut edge, the better the reinforcing ring you can form. See also Protect new plants from the cold with upcycled soda bottles. Warm a nonstick skillet over low heat. With the cap removed to allow heat to escape, push the cut edge of the bottle gently onto the skillet. 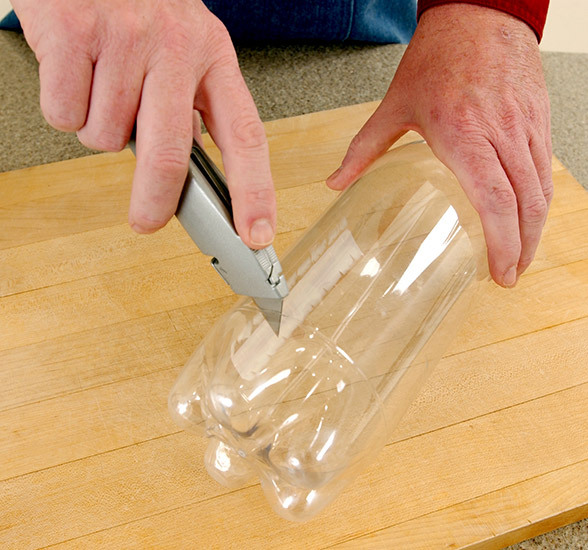 Apply light, downward pressure to the cut edge, keeping the bottle upright and slowly moving, to melt the plastic evenly. Let the edge curl in 1/8 to 1/4 in. You may have to try this several times before you get it to come out perfectly. But be patient. Once you get the feel of it, you’ll be able to roll the edges of several cloches in a few minutes. If something goes wrong with the curling process, just cut the imperfect ring off, smooth the new cut edge and try again. 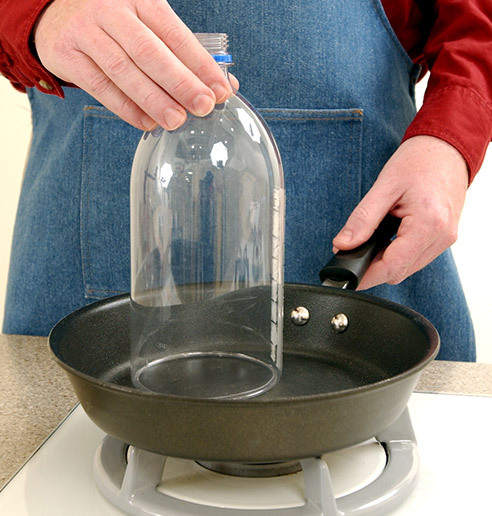 Quickly remove the bottle from the skillet and place it over the bottom of an inverted, 2-cup glass measuring cup. The tapered sides of this cup let the softened bottle nestle down firmly and form a perfect ring as the plastic cools. This cooling and hardening process is very rapid, so have the measuring cup close up. Keep the bottle turning as the plastic is hardening to prevent sticking. 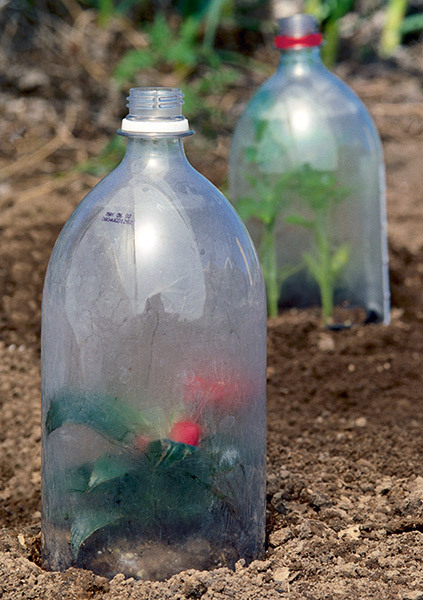 When you place the cloches over young plants in the garden, keep the bottle caps off during the day. 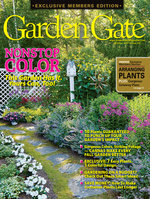 This will prevent heat build up from damaging the plants. In the evening, replace the caps to trap heat and keep the plants warm and comfortable.